Banstead War Memorial In Its Original Position - a Memory of Banstead. 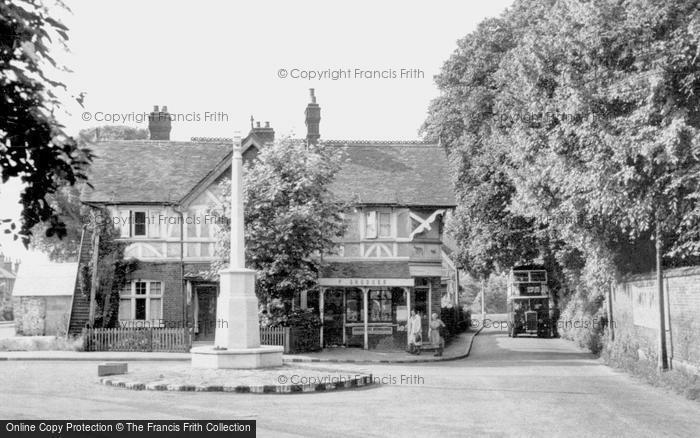 This card shows the Banstead War Memorial before it was moved to its current positition in the 1990s. Sutton Lane was very narrow in earlier times and conductors used to have to get off the bus to check that there was not another one coming the other way. Often the buses had a hard time coming up the hill from Sutton and an old watering can was kept by the Woolpack to enable the driver to top up the radiator. If you would like to know more about the history of Banstead, check out the Banstead History Research Group website. You will also find an ongoing project to research the history of the memorial and the stories of the men listed on it. I would particularly like to find any information about the rededication of the memorial after WWll. Please contact me via this site or the Webmaster link on the BHRG web site. Jan 2010 update - nearly three years on and still I have not found anything on the rededication of the memorial. I am now writing a book on the men listed on the memorial. A memory shared by Lewis Wood on Feb 24th, 2007. Send Lewis Wood a message.